Every year I think we will run out of themed costume ideas or not be able to agree and every year I am surprised. It gets harder and harder to pick a theme that everyone likes/gets excited about. 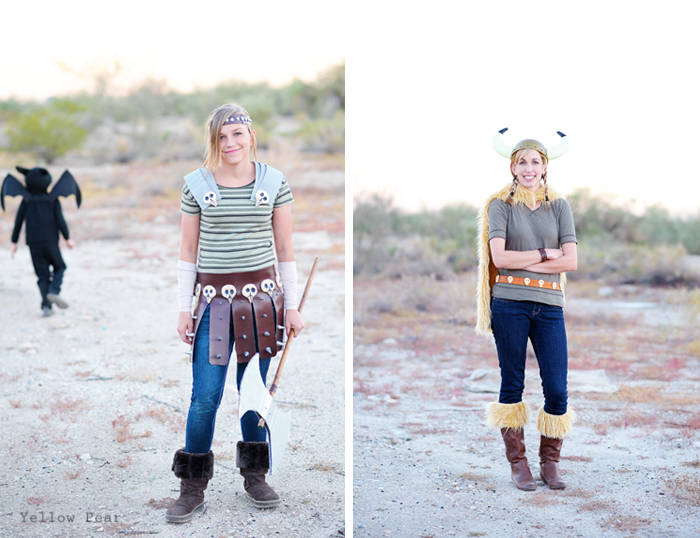 This year we went through about 3-4 ideas until we decided on How to Train Your Dragon characters. And it was perfect. We have been preparing for weeks. 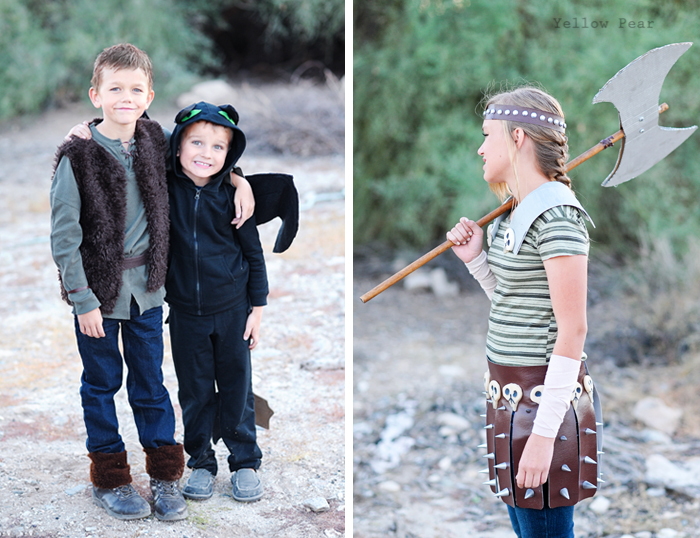 We knew we needed a lot of fur, leather and lots of details for Astrid's costume. We visited Goodwill multiple times and all brainstormed ideas on how to make the costumes work and for a fairly decent price. Dennis was Hiccup. I found a giant green shirt at Goodwill and cut and sewed it down to his size. We used leather strips at his neck and wrists. I found a remnant of awesome fur for his vest. I just traced around a shirt for the pattern and as I was using self-sealing fur, I didn't have to hem all the raw edges. Bonus. Then he just wore skinny jeans, boots, a belt and I made some boot covers out of fur scraps and velcro. And then for the final touch, we painted his hair with brown acrylic craft paint thanks to my sister-in-law's suggestion. I couldn't get over how strange he looked with brown hair though. Q chose to be our own Toothless the Dragon. I was a little hesitant about making a dragon costume, but after some research, I got excited and optimistic. 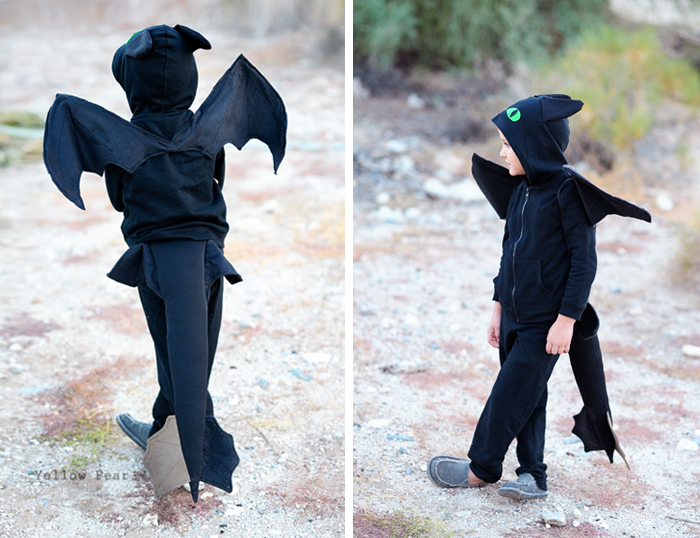 I found an easy dragon wing tutorial here, and bought a black hoodie and black pants. I kind of made up his tail as I went, looking at pictures of the dragon's tail in the movie and pictures of other costumes I found online. The tail has a ribbon and Velcro belt sewn to the top that attaches easily around his waist. The last thing I did was add some floppy ears and felt eyes to his hood. He LOVED his costume and flew around the neighborhood like a crazed animal and we could barely keep up with him. Mr. C wanted to be Gobber but he has a peg leg and a long braided mustache. 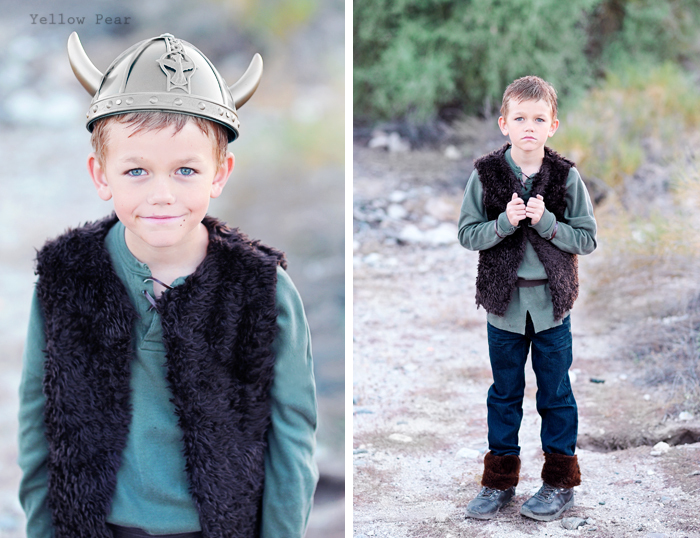 I couldn't figure out how to pull off those two things and so he decided to just be a village viking. 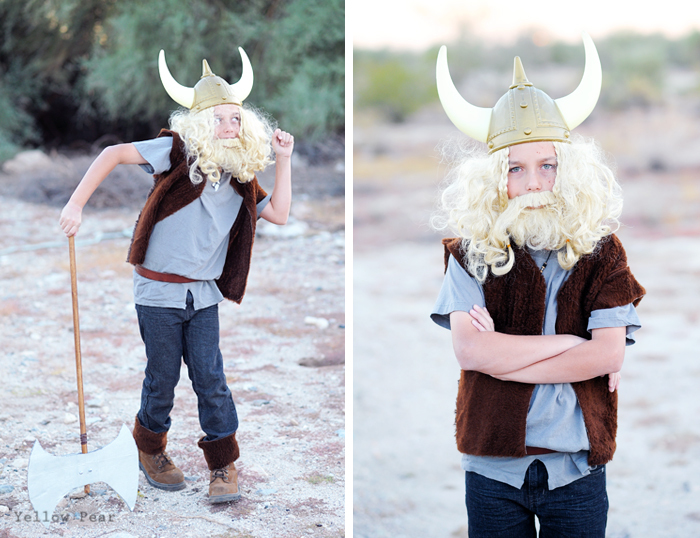 I had bought a wig in hopes of somehow making a braided mustache, so he just wore the awesome wig/beard combo and a viking hat. I made a fur vest with sleeves and bought a plain grey shirt from Goodwill. He also wore his shark tooth necklace, a leather belt and fur boot covers. 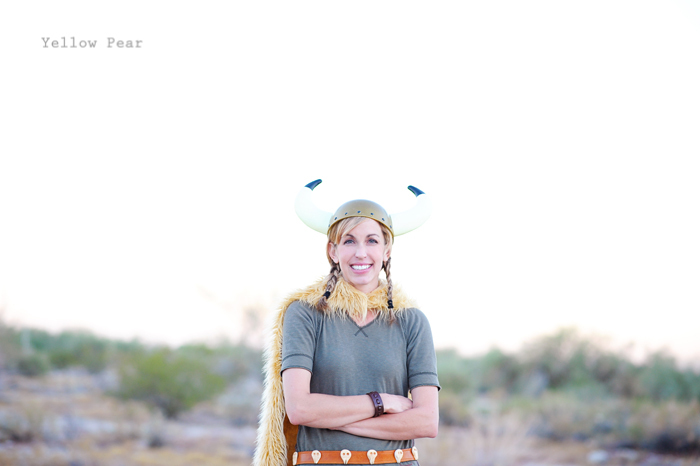 Miss B was ecstatic about being Astrid. She identifies well with the character and is blond and green-eyed, so she was a perfect fit. She made the entire costume herself including sculpting the bird sculls from Sculpey clay and having the genius idea to spray paint googly eyes for the brads on her headband and ax. She stained the ax handle, cut and painted the cardboard ax, cut her leather skirt into equal strips, and cut and painted craft foam for her shoulder armor. We found plastic spikes on a spiked collar at Goodwill and she cut them out in descending sizes. 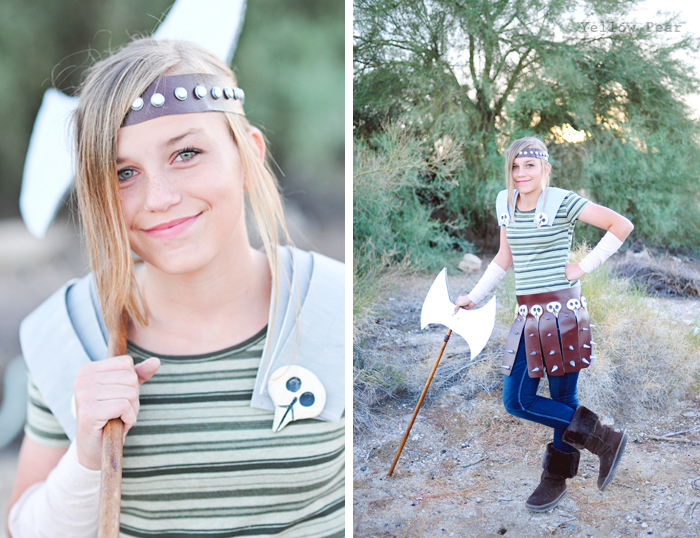 I sewed Velcro on her headband and skirt, glued down the skulls and spikes and re-sized the shirt we found at Goodwill. She wrapped ace bandages around her forearms and borrowed the boots. It was such fun to work on these costumes together. We had thee best time. There aren't many main women characters in the movie, so again, I chose to be a random village viking with Mr. C. Miss B didn't like her first attempt at clay skulls, so I glued them onto my thrifted belt and it turned out awesome. I have some lovely fur for newborn photos and so I cut a thin strip off for boot covers and used the rest as a cape. I borrowed a leather cuff from Miss B, and I already had the green shirt. 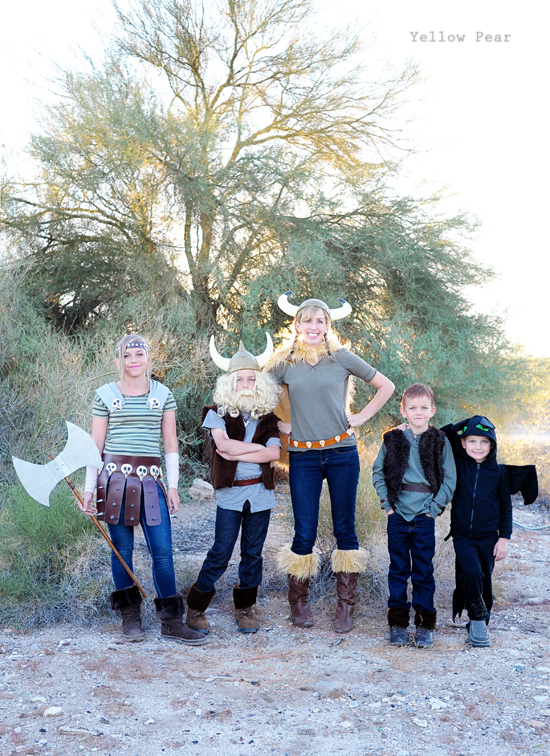 We got all of our viking hats from Amazon. 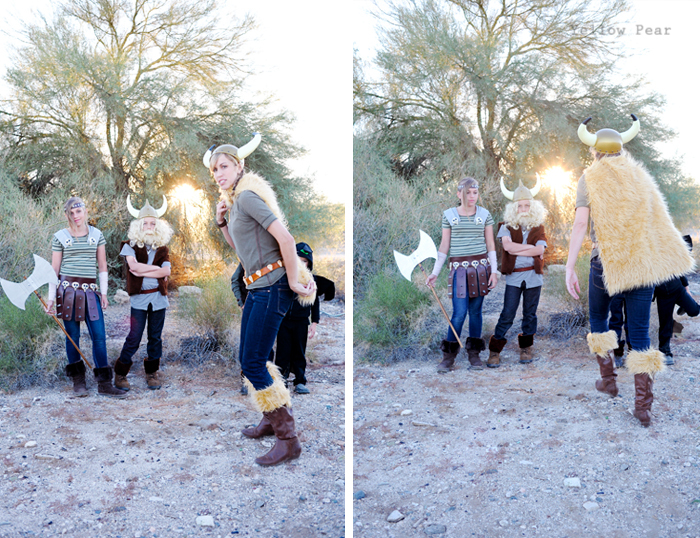 I found some hysterical outtakes of me trying to outrun the self-timer (our assigned photographer...Dad...got caught in some awful traffic-he wore a Vikings football jersey for Halloween. Ha!). I love my cape billowing in the wind. I have about 12 shots of me running in various stages. "Wait did I set the timer? Oh I did. RUN you fool, make that cape fly!" Also don't be fooled by the happy smiles. The children were NOT happy with me for taking pictures. :) They were bouncing off the walls and irritated and antsy and impatient and just plain difficult. Such is life on holidays it seems. Too much anticipation and excitement to be contained. So the little boys sprayed men's spray-on deodorant/body spray in the van and at each other while I was finishing up with the two older ones. Everyone was hungry and practically dying. Q thought it wise to lay on the dirt and sticker covered ground in his all black costume and pose in the strangest of poses for his pictures. Mr. C kept photo-bombing on "accident" as he kept insisting and Miss B was extremely impatient with the entire process. But in the end we had our fancy dinner of sandwiches and went on our merry way to knock doors for candy and had quite the pleasant end to an otherwise crazy afternoon. Chaos is welcome here. I think I thrive on it now or something.